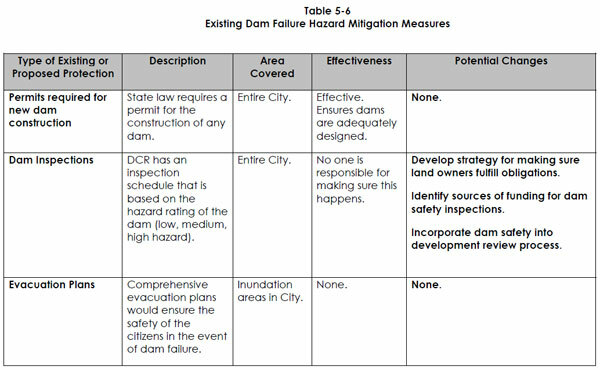 Northampton’s Office of Planning and Development has made the new Proposed Local Natural Hazards Mitigation Plan (PDF) available for public review. The Planning Board will hold a public hearing on this plan on November 13, 7pm, in City Council Chambers, 212 Main Street. We compared the new Plan to the existing one, which the City Council signed off on in 2004. We gave special attention to wetlands regulations. Wetlands play a valuable role in mitigating both floods and droughts. Unfortunately, the City Council voted 7-2 in 2007 to permit development in multiple districts to encroach as close as 10 feet to wetlands. 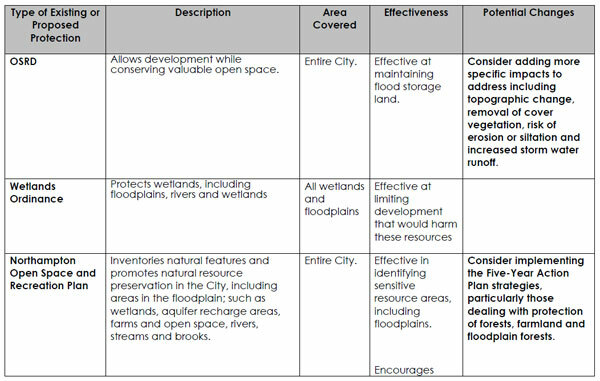 In a rapid shift of priorities, facilitating urban infill was now deemed more important than flood mitigation, water pollution control, or urban greenspace. The proposed condo development off North Street is a good example of a project that relies on the narrowed buffer zones. 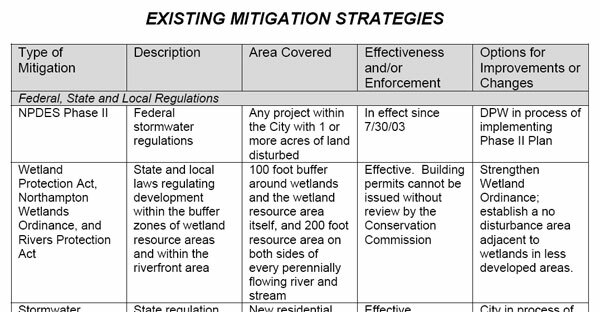 Enacted local government buffer ordinances show a wide range of wetland buffer dimensions. The lowest we found was 15 feet measured horizontally from the border of the wetland, with the highest approximately 350 feet. Several ordinances set 500 feet as a distance for greater regulatory review of proposed activities, but do not require nondisturbance at this distance. Often the ordinances provide a range of protections, with nondisturbance requirements nearest the wetland and various prohibitions and limitations as the distance from the wetland increases. Among the ordinances we examined, the largest number of ordinances clustered around nondisturbance or minimal disturbance buffers of 50 feet or 100 feet, with variations (usually upward variations) beyond these based on particular wetland characteristics, species of concern, and to account for areas with steeper slopes. Most striking in the ELI report is that some locales desire wider buffers in areas of intense land use to address the higher levels of pollution and runoff. By contrast, Northampton has its narrowest buffers in these areas. Earlier this year, NSNA engaged Hyla to compare Northampton’s new Wetlands Ordinance to the regulations in other cities across Massachusetts. Hyla found that Northampton is now an outlier. In the entire state, it’s hard to find anything similar to our 10-foot buffer zones for new development. When arguing for the new Wetlands Ordinance in 2007, Bruce Young, Land Use and Conservation Planner, said it was necessary to allow homeowners to build small accessory structures (e.g. in-law apartments) on their property. We are sympathetic to this argument, but it’s a far cry from the 26 condos, new roads and parking lots that Kohl Construction wants to build in the North Street woods. 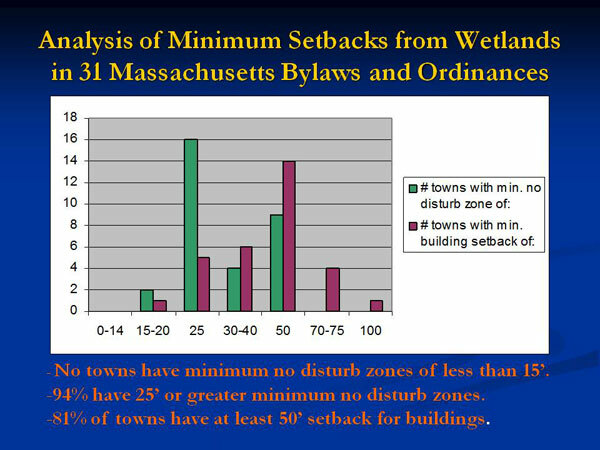 Before the new Wetlands Ordinance took effect, the de facto standard for most of Northampton was that structures should be kept at least 50 feet away from wetlands, and disturbance within 50 feet should be minimized. We believe this standard was scientifically sound, in line with practices elsewhere in the state, and should largely be returned to. Concentrating development in infill neighborhoods, intended to preserve contiguous open space in outlying areas, has an abstract appeal. However, it must be balanced against urban residents’ need and desire for nearby greenspace, and a respect for local conditions. 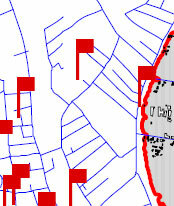 Specifically, a large part of the built-up areas of Northampton are situated in low-lying areas. Flooding is a significant risk, even for structures outside the 100-year floodplain. To eat into Northampton’s natural flood protection system is unwise, as is a reliance on hard-to-maintain manmade stormwater management systems. Repairing the three dry wells at Bridge Street School was ranked as the [Northampton Public Schools’] second highest priority. The wells are filled with silt and the ground water backs up into the building. The DPW has cleaned the wells but the problem still exists due to the lack of slope and the deteriorated condition of the wells. Flooding has been among the most costly natural disasters in recent years. The report cites the flood caused by Hurricane Floyd in 1999 that causes $900,000 in damages. In the map below, the red flag behind View Avenue (the topmost flag) indicates a flood damage report from Tropical Storm Floyd (1999). This area is in the eastern portion of Kohl Construction’s proposed condo site, one of the more elevated portions. We infer that much of Kohl’s property may be at risk from heavy rainfall events. Flooding from stormwater runoff is a growing problem in every urbanized area and is caused by large amounts of impervious surfaces and by undersized or poorly maintained stormwater drainage infrastructure, including culverts and detention basins. Development not only creates more impervious surfaces, but it also changes natural drainage patterns by altering existing contours by grading and filling, sometimes creating unexpected stormwater flooding during heavy rains. Recently, the City of Northampton has seen flooding on Elm Street, along Church and Stoddard Streets, Bliss Street and Austin Circle due to undersized pipes and catch basins and lack of upstream detention that caused streams to jump their banks and flood roadways and properties. …In addition to flooding from hurricanes and northeasters, Northampton is also susceptible to flooding from severe rainstorms and thunderstorms. The occurrence of significant rain events in the City has been increasing over the past several years. The greatest impact in the City is felt in neighborhoods along rivers and streams. In recent years, heavy rainstorms have caused significant problems in more urbanized areas as increased development inhibits proper drainage and existing or poorly maintained water systems cannot handle increased stormwater runoff. 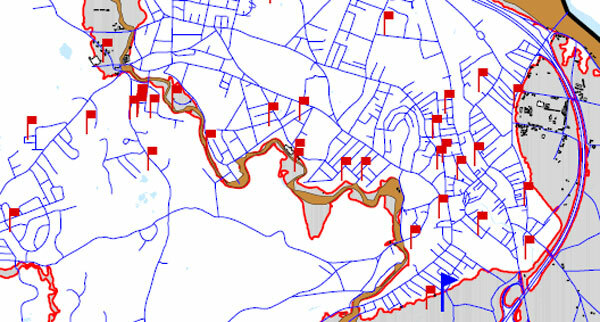 The most recent example is the flooding following Tropical Storm Floyd, a 100-year storm that occurred in September of 1999 which created severe localized flooding conditions in the small flashy watersheds of the City, especially along the Mill River and the historic Mill River (both within and beyond the mapped Zone A), and along Barrett Street Brook and Elm Street Brook (both outside of Zone A). This storm caused approximately $900,000 in property damage. The following view dramatizes the considerable amount of impervious surface already in the area, especially around King Street and the Coca-Cola plant. Kohl’s “infill” project will convert a significant amount of the remaining greenspace to impervious surface. The presence of Millyard Brook shows that this area serves as a natural sink for water in the neighborhood. As Hurricane Threat Builds, Has Complacency Set In about Flooding? wife area to be the highest of any portion of the Mystic River watershed of which it is a part. 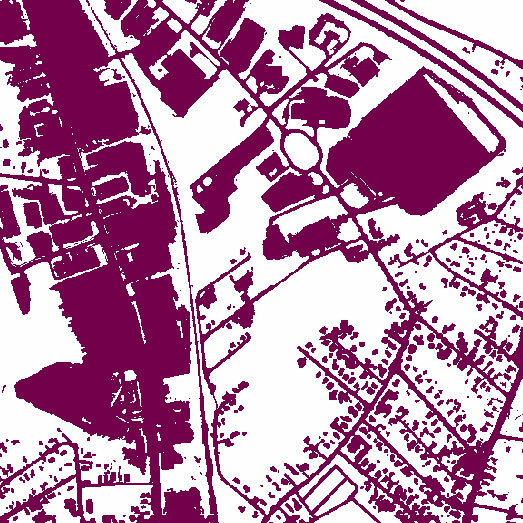 …the LibDem Councillors, at a recent Cabinet meeting produced documents promoting an increase in “high density developments” in Teddington, Whitton and Twickenham. This is an issue I will come back to as a separate debate on planning, but given the flood risks in the area, should we really be concreting over our green spaces and further reducing drainage potential and increasing flash flood risk? [Alexandra Dawson, chair of Hadley’s Conservation Commission, writes,] …Northampton has adopted changes to its bylaws that limit the setback between development and wetlands in the business district to 10 feet, although it is obvious that 10 feet is not even enough space to accommodate the big yellow machines that do the building. It is true that a recent court decision indicates that wetlands ordinances (or conservation commission regulations adopted under them) should enumerate setbacks so that builders need not guess what will be required of them. Unfortunately, there is also case law stating that whatever is so established limits the commission’s discretion to ask for more unless there is a specific showing of why one proposal stands out from the others. If the setback in the ordinance is 10 feet, it will be very hard for the commission to justify a permit restricting building for 50 feet. For this reason, most eastern Massachusetts bylaws that contain setbacks start at 25 to 50 feet. The developers built 255 units of affordable apartments there. They crammed them in everywhere they could, pushing them up into the bluffs, and close to the creek and wetlands. No backyards to speak of. One third of the buildings were built within 50 feet of the wetlands, 63% of the buildings are within the customary 100 feet of wetlands. When I asked about the possibility of basements flooding in the future due to their proximity to the wetlands he indicated that some of the units would have basements provided they can be “drained to daylight.” Others would be constructed on concrete slabs. He also noted that most of the units would have one garage bay located within the perimeter of the buildings on the first floor, reducing the need for surface parking by one space for each of these units. It remains unclear to me how large construction equipment can operate very close to wetlands without harming them. It appears some of the units would be located within twenty feet of the wetlands. At-Large Councilor James M. Dostal, who opposed the ordinance along with Ward 7 Councilor Raymond W. LaBarge, said he was concerned about flooded basements and people being flooded out in concentrated development areas near downtown. Wetlands do not need to be maintained; they just need to be protected. In Carlon Drive, they simply scooped out a hole in the swamp-bottom, and called it a detention structure. Today it is just a pond, and a stagnant smelly one. It was designed to have a dry forebay, and a shallow main chamber was supposed to have only about 6 inches of water in it. This was supposed to be a compensatory wetland, full of cattails and wildflowers. A rock check dam was supposed to hold back the “first flush” off the parking lots and trap pollutants, and outflow from it was supposed to feed the wet part of the detention pond. Here rain water pouring off the new parking areas and street was supposed to be stored, and discharged safely. op of the bank. There’s no storage to speak of, no discharge, no filtering. As it is constructed now, grey water from the parking lots and the access street goes directly into the swamp and the Connecticut River. To reduce nonpoint source pollution from stormwater runoff, the Connecticut River Strategic Plan proposes the removal of impervious surfaces within 50 feet of streams and the investigation of “functional replacements” (such as the use of permeable pavement) for impervious surfaces within 100 feet of streams, in developed areas (PVPC, 2001). In the urbanized areas, the removal or retrofitting of impervious areas and the implementation of Stormwater Best Management Practices (BMPs) could be beneficial in improving water quality. Infill, Kohl Construction Plans, Neighborhood News, Ordinances and Regulations, Wetlands, What You Can Do. permalink.